Nigeria’s Ngozi Okonjo-Iweala, Minister of Finance has now received tremendous support for her nomination to become the next president of the Word Bank. Recently, The Economist described her as an orthodox economist whose CV is that of a formidable public economist, in a clear endorsement. It reports that for almost 70 years, the leadership of the IMF and World Bank has been subject to an indefensible carve-up. The Financial Times also joined the Economist in campaigning strongly for Okonjo-Iweala. The London-based newspaper in an article titled “The right leader for the World Bank” said it believes Okonjo-Iweala is best qualified. And Okonjo-Iweala is perhaps one of the very few prophets recognised back at home. Yesterday, The Nation reported that the House of Representatives had rallied round support to back the candidature of the coordinating Minister of Economy. Ogbuefi Ozomgbachi (PDP, Enugu) said that this was the first time Africa as a whole will be supporting the candidature of fellow Africa for the top position. “I urge the House to commission Committees on Inter-Parliamentary and Foreign Affairs to rally support for her,” he added. Many believe, the coordinating minister of the Economy deserves all the support and more as she has the best credentials for the job. The Guardian suggests however, the fatalist view is that Okonjo-Iweala cannot win because she is not American. 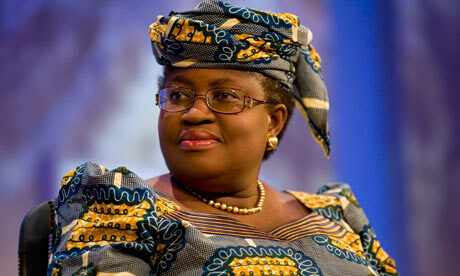 According to The Guardian, Okonjo-Iweala can and should win, but it will take an effort. It lists a five-stage scenario of how events could play out. Given America’s traditional stranglehold on the position, the US nominee cannot simply be dismissed. All countries will say very nice things about Kim, and rightly so. He is a terrific individual. Everyone regretted letting the Americans ram through their choice of Paul Wolfowitz in 2005. The damaging consequences of that fiasco are still fresh in people’s minds. While Kim does his “listening tour”, countries can pay heed but not commit openly. They can insist that the process be allowed to work before decisions are taken. In short, they can remain on the fence. Not every admirable individual is qualified to be head of the World Bank. Kim’s views against economic growth and private investment (detailed in his book, Dying for Growth) are already raising eyebrows in the press and causing concern among world leaders. Political leaders in the UK and Germany must wonder how Kim’s negative views about fiscal austerity and neoliberal structural adjustment apply to Europe. A key question the British have to ask is: “Do his views imply he is against David Cameron’s reforms?” A key question the Germans have to ask is: “Given that the International Monetary Fund (IMF) programme in Greece is exactly like those he has vehemently opposed, is Kim for or against it?” It is hard to see how the Europeans – whatever “gentleman’s agreement” may have taken place with the US regarding the leadership of the World Bank and IMF – can endorse someone whose track record puts him firmly in opposition to their own policies. Moreover, Kim is a doctor and the narrowness of his expertise is likely to raise concerns among the bank’s big borrowers, given the array of issues a full service development organisation must address. If Kim really is the best-qualified candidate to head the World Bank, countries will want to know why, in months of search, speculation, media discussions, and blog debates, his name was never raised, even by those now endorsing his candidacy. The Obama administration has put itself in a win-win situation. The alternative to Kim is Okonjo-Iweala, who is not a threat to vital US interests, is a mainstream development expert with sterling credentials, and happens to be an African woman. She has been widely praised, not least by Lael Brainard, the current undersecretary for international affairs at the US Treasury. The US has many vital strategic interests, but having Kim lead the World Bank is not one of them. Obama won’t look weak in “losing” the seat with Kim, he looks strong in showing that America can lead and co-operate. More cynically, it is not clear Obama really wants Kim around come November’s elections. Two key issues Republicans will raise are Obama’s ability to oversee economic growth and his plans for healthcare. Critics of the Obama administration will seek to gain maximum leverage from Kim’s views on economic growth, opposition to transnational corporations, and praise of Cuba’s healthcare (and Castro as a leader). That such attacks would be unfair is beside the point; Obama’s team may decide that defending Kim in November is a greater risk than allowing an African woman to head the World Bank (it will also please his support base, and isn’t a voting issue for opponents). Obviously, the US will never publicly back away from Kim, just subtly not go all out in support. Once it is clear Okonjo-Iweala can really win, countries will rush to get off the fence. For most countries, choosing Okonjo-Iweala vindicates the principle that the organisation’s head can be chosen on merit. She is clearly the best candidate for those countries that want a broad development agenda at the World Bank, which includes all the big borrowers and emerging-market countries that benefit from continued engagement with the bank. Who wants to be in the position of defending a less qualified American man against a stronger candidate who just happens to be African and a woman? 9ja, NO WONDER THE ECONOMIST,LONDON TIMES, UK, WTO & OTHER BRETTON WOOD inst. WANTED SUBSIDY REMOVED BY OKÖNJO I. NOW I KNOW, SHE'L BE REWARDED WITH the W/BANK PRESIDENT.